The primary reason most people use a Cost of Living Calculator is to compare two cities for job purposes. If you are considering accepting a job in another city it is nice to know how costs in that city will compare. When I was a teenager, long before the internet, I knew a family that moved from Florida to Long Island (where I was living at the time). The husband had gotten a job offer along with a nice raise but after a couple of years they realized that even though they were making more money they weren't any better off because taxes, gasoline, and the overall "cost of living" was much higher in New York than in Florida at the time. So they moved back to Florida. Fortunately, these days you don't have to make the same mistake. You can use Our Cost of Living calculator and compare not only various living expanses but also average salaries in your field between both locations. As a sample I compared the cost of living in two cities I am personally familiar with, Richmond, VA and Albany, NY. 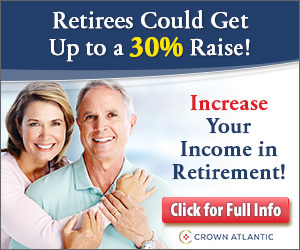 The calculator said that if you earned $50,000 in Richmond the equivalent salary in Albany would be $53,493. and that overall it is 7% more expensive to live in Albany than in Richmond. Groceries are 2% more expensive, housing is 29% more expensive and transportation is 10% more expensive in Albany than in Richmond. 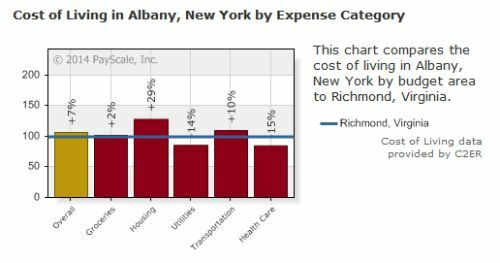 Surprisingly, utilities and health care are actually cheaper in Albany than in Richmond. As you can see from the above chart Richmond, Virginia prices are represented by the blue line and Albany, New York prices are represented by the vertical bars. In a seperate chart it will also compare costs in your destination city (in this case Albany) with the costs of other major cities like Phoenix, Miami, Anchorage, Dallas, New York and Knoxville. In addition, if you enter a job title into the calculator it will tell you the low, typical and high salaries for that job description in the new area and how much you have to earn to be the equivalent of what you are currently earning. An inflationary indicator that measures the change in the cost of a fixed basket of products and services, including housing, electricity, food, and transportation. The cost-of-living index is published monthly. Also called Consumer Price Index (CPI). Follow these links for more information on the Consumer Price Index and Current, Historical Inflation rates and International Inflation Rate Links. A major component of your cost of living is your mortgage. If you are moving and looking for a new Mortgage you can compare rates from many lenders at our mortgage page. You might also want to read the adjacent article about Low Mortgage Rates- Reduce your Payment or the length of the Loan?